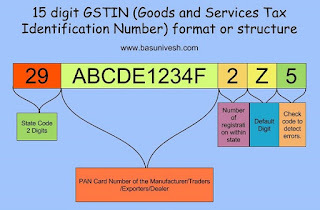 Home > GST > What is the structure - format of 15 digit GSTIN - Goods and Services Tax Identification Number..
What is the structure - format of 15 digit GSTIN - Goods and Services Tax Identification Number..
GSTIN is a 15 digit unique code which is will be assigned to each taxpayer, which will be State-wise and PAN-based. The structure or format of 15 digit GSTIN (Goods and Services Tax Identification Number) will look like below. The first digit of GSTIN is state code as per Indian Census 2011. The state codes are as below. 35 Anadaman and Nicobar Islands. It is the PAN number of a business entity like your shop, mall or company. It indicates the number of registrations as a business entity has within a state for the same PAN. It will be an alpha-numeric number (first 1-9 and then A-Z) and will be assigned on the basis of the number of registrations a legal entity (having the same PAN) has within one state. Let say the company ABC registered in the same state for 5 times for different businesses. In such case, this digit will be printed as 5. Let us assume, the same company registered for around 15 times, then it should be represented as F (1-9 numeric and later on 10th registration be named as A and 11th as B and so on up to Z). Hence, a business entity can register the GSTIN within a single state for the maximum of 35 times (1-9 and later on A-Z). It will be by default as Z. Goods and Services Tax (GST) is an indirect tax applicable throughout India which replaced manifold cascading taxes collected by the central and state governments. GST is an indirect tax that will be collect on goods as well as services. GST will be divided into three components the Central Goods and Services Tax ,State Goods and Services Tax, Inter State GST. GST aims to repair the indirect taxation of the world’s 7th largest economy regarding GDP. The primary concern about GST will be as India is a very vast and diverse land, so it will not be easy in the completion of a uniform tax for the entire country.